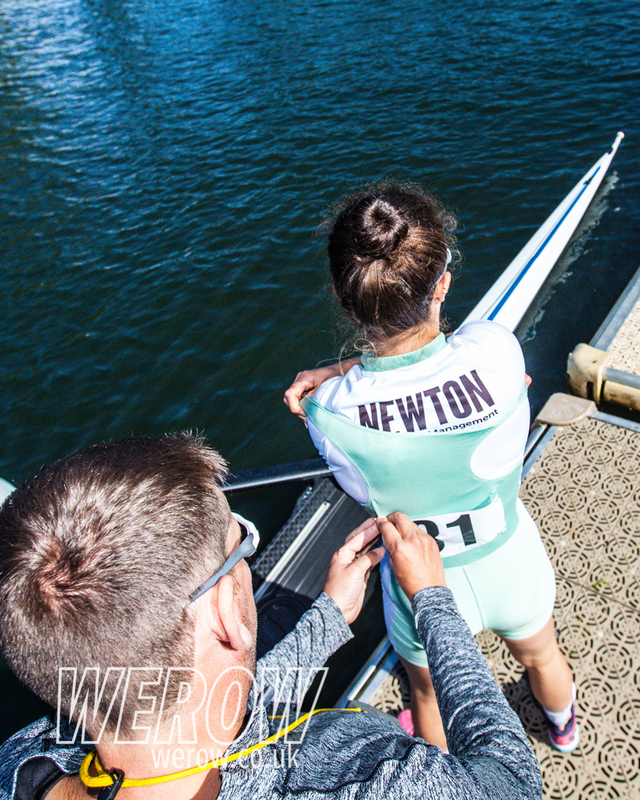 Saturday at Henley Women’s kicked off bright and early with the junior time trials, as all the usual suspects made it through qualification. In the opening rounds, Henley RC raced to an emphatic victory over Royal Shrewsbury School by 3 ½ lengths, in an incredibly classy performance from a junior crew. Elsewhere in the junior quads, Tideway Scullers suffered an early upset in their opening heat, hitting the booms and catching a crab, but stormed back through Queen Anne’s to win by 3 lengths. The Junior 8s will be an all-American affair, as all four semi-final crews hail from the other side of the Atlantic. The Championship singles hosted a battle of the Blues today, as Imogen Grant of CUWBC went up against Estonian Olympic-hopeful Elo Luik of Molesey, who rowed for Oxford in 2016. Lightweight Grant was down off the start, but following a wobble from Luik, came back to level the playing field before taking control of the race and sealing her victory by 4 lengths. Imogen Grant is the sole British sculler left in the semi-finals in a field of very strong Australian scullers. In the Aspirational singles, BUCS winner Siena Hayes of Cardiff University set off to a flying start in her quarter-final, stealing a length off the start from her Star and Arrow opposition. The composite potential GB U23 eight made a strong start to their regatta as they calmly controlled their race against Drexel University of the USA. This crew are the only Brits left in the Championship 8s, whilst Yale have two crews through to the semi-finals. Last year’s winners of the Intermediate Club 8s, Cantabrigian, secured their position in tomorrow’s Aspirational 8s semi-final against Thames, having rowed away from Agecroft to win by half a length. In the Champ 4x- a gutsy Newcastle crew came from behind to overturn Oxford Brookes by ¾ length. Tomorrow they face a very strong and so far unbeaten crew from Leander, whilst on the other side of the draw, there is a London derby between Thames Rowing Club and the University of London, who saw off a strong German crew by ½ a length to secure their semi-final spot. The Aspirational Quads gave way to some dominant racing today, as 5 of the heats were won easily. In the quarterfinals, racing was much tighter and many crews showed true grit as they progress to tomorrow’s semi-finals. As always at any event on this stretch of river, the Coxless 4s were subject to some steering issues. In the Aspirational event, following a clash off the start in the quarter-final between Lea A and Royal Chester, the race was restarted. The Lea crew, partially made up of last year’s winning Intermediate Club Coxed 4, rowed to a win of 1 ¾ lengths. Other crews experienced the same trouble with steering, as St Andrew Boat Club hit the booms shortly into the race, allowing their opponents to draw away to a 2 length victory. Racing starts at 9:05 tomorrow, with the first final at 14:20. You can catch all the action on the YouTube livestream.